With just two days left before the third Republican Presidential Debate, trading is starting to heat up on Ballotcraft. And while you’re going to have to be active on Wednesday night to win your league, implementing a strategy now might be enough to get a leg up on the other traders. So with that in mind, here are the big trends we’re seeing on the market and how you can use them to get ahead. Rubio Finally Takes Frontrunner Spot, But Will How Far Can He Rise? The winner of our first debate game has finally taken his place as the leader of the field, with Florida Senator Marco Rubio boasting a double-digit lead over the next candidate. For Rubio supporters, this may have seemed inevitable; while other insider candidates, from Bush to Walker, dropped from relevance due to the mounting strength of the anti-establishment wing of the party, Rubio has remained solidly in contention and is now poised to consolidate support among the moderate crowd and give Trump and Carson a run for their money. If Rubio succeeds in distinguishing himself from the other establishment candidates and outperforms the outsiders, this debate could mark the beginning of his long-awaited reclamation of the title of GOP frontrunner. But even though Rubio’s spot at the top is not without warrant, the size of his lead so far in advance should be cause for concern. No Republican candidate has come into a debate with this high a price or this large a lead over their competitors. And though Rubio did eventually pass the 30 point mark on his way to a second-point finish last month, this is still largely uncharted territory for the senator. 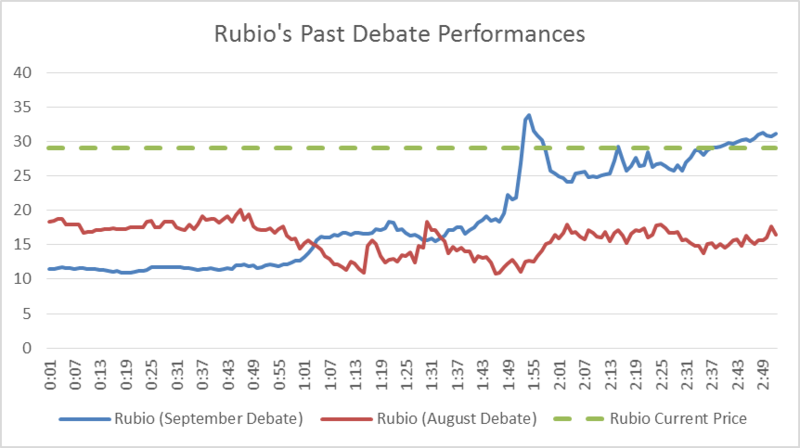 When Rubio was among the frontrunners during the first debate, he had trouble making any waves, and instead dropped a few points before re-rising and dropping again. Now that he has sole possession of the lead, chances are he’s going to have even more trouble making gains in the crowded field and won’t yield you much profit over the course of the debate. Looking at the performance of previous frontrunners also gives credence to this idea that Rubio will have trouble maintaining his lead. 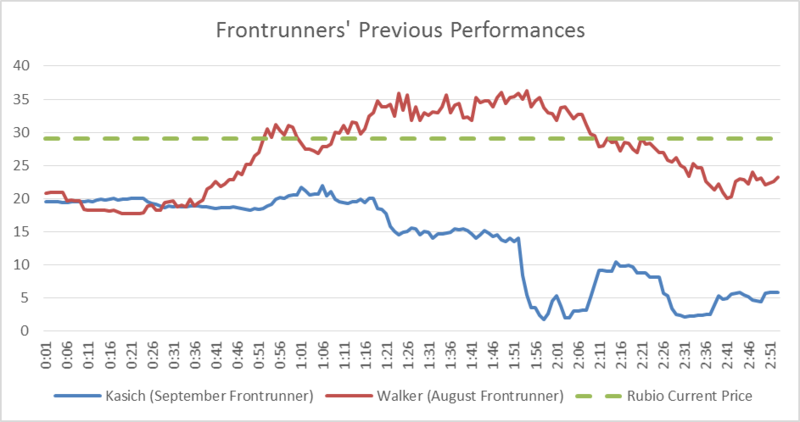 Walker fared fairly well in the first debate before a late-night collapse led to him losing the lead, but Kasich basically fell out of the lead as soon as the debate started before ending with a single-digit price. But even Walker barely passed Rubio’s current price, giving me little hope that holding on to Rubio’s stock will be a good way of guaranteeing yourself first place in your league. I would recommend selling most of the shares you own of Rubio, and investing them in some lower-priced candidates (Fiorina, Bush, and Christie would all be interesting pickups at their current prices) to get more money to invest later on. I’d say if Rubio is at 35 points or higher by the first commercial break, then by all means go all in. But if he isn’t leaving the rest of the field of behind, then there won’t be any harm in waiting until the end of the night to decide if you really think he’s going to be the winner. While Senator Rubio, winner of our first debate focus group, currently leads the pack with a commanding 30 point price, last month’s winner, Carly Fiorina, is trailing behind at just 17 percent. Fiorina dominated the vote and the market during the last debate, winning both handily without ever really feeling any competition for the top spot. So why can’t she even take a solid second place leading up to Wednesday’s debate? The answer is probably that her poll numbers haven’t increased too much since the last debate, a sign that her debate performances don’t really improve her chances, which is, after all, the question we ask of our focus group to declare a winner. But I would argue that this shouldn’t keep you from buying Fiorina as soon as possible. Carly has barely campaigned at all so far this year, meaning the only thing keeping her afloat in the polls is her debate performances, which have been irrefutably strong. Even if a great debate doesn’t lift her polls it will keep her from sinking, which is a pretty good net gain in the eyes of our focus group. Secondly, we hold our vote right after the debate, meaning that our focus group is heavily influenced by the performances and may think less about their context in the primary race. 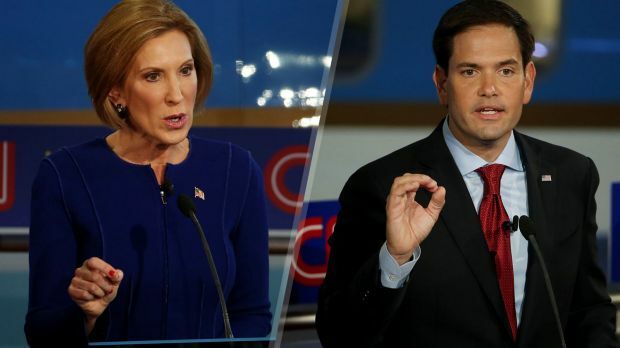 This favors Fiorina, who has a knack for big moments and strong finishes which linger with our voters. And all of this ignores how much Fiorina will benefit from the structure and subjects of the CNBC debate. The shorter debate means there’s going to be more prepared statements and less follow-up questions, which plays right to her strengths. There will also no doubt be a large focus on business and Wall Street, areas in which Carly is experienced and easily capable of claiming as strong spots for her presidency. And finally, CNBC’s hosts lack the political interview experience of the more established networks, which will likely benefit Fiorina, who shared a fair amount of questionable claims in the last debate. All in all, I think Fiorina should still be a favorite to win Wednesday night, and would recommend you buy her before the rest of the traders catch on. Finally, we reach the two candidates who have completely failed in their performance over the last two debates. Donald Trump and Ben Carson have ended both debates with lower prices than they started with and yet both are priced in the double-digits, with Trump actually taking the second-place spot, far above what I think their stock should be worth. 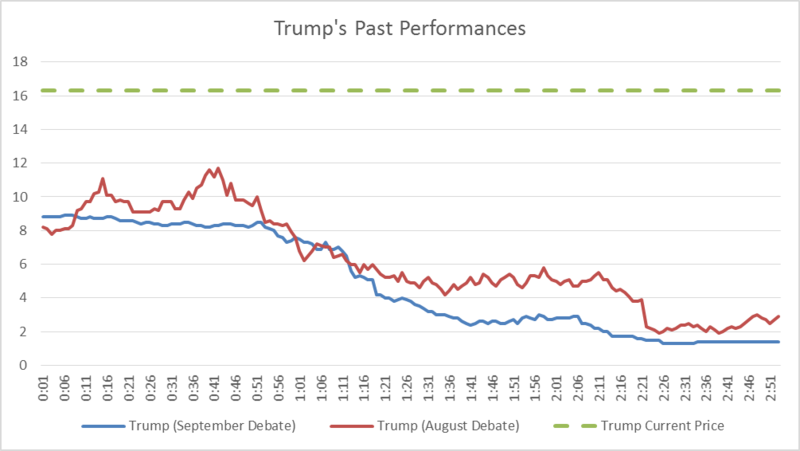 Let’s start with Trump: He’s priced so much higher than he has ever has been before that I think it’s inevitable that his price plummets early in this debate. Sure, he’s done more to establish himself as a real candidate in past weeks and sure, this debate format will favor him more than the three-hour marathons of the past, but he still has failed to show he can engage in a successful political discussion with his peers. While his grandiose style may please his supporters at his rallies, it has had a negative effect on our focus groups as it shows how poorly he would lead his party and work within the Washington system. Unless he comes out on the stage as a changed man, you should completely avoid his stock and could probably make a good profit shorting it. 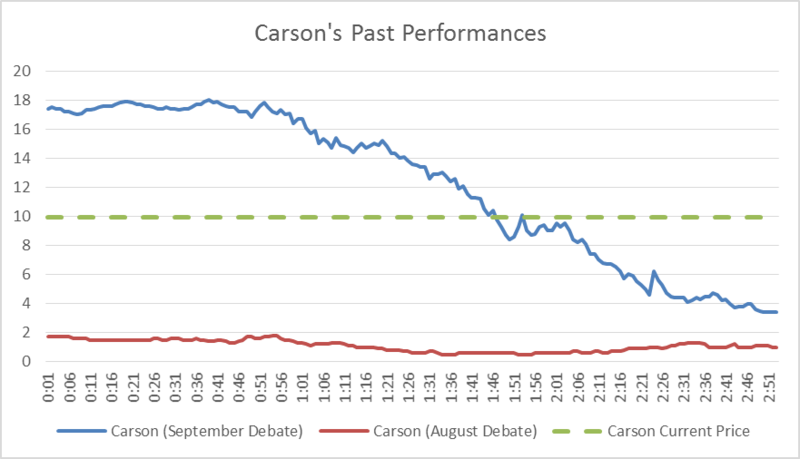 As for Carson, his prospects seem even bleaker, since he couldn’t even boast Trump’s short term gains during the September debate. While the lower price does a good job of reflecting voter’s lowered expectation, Carson’s recent string of gaffes and outrageous statements does little to convince me he won’t end up right back below four percent, where he’s ended up the last two debates. Carson will be receiving more questions this debate, since he is now definitely the second-place candidate in the polls, but that means nothing if he can’t capitalize on the opportunities. See how he does with his first question before making a final verdict on the neurosurgeon, but if you’re getting a sense of déjà vu, chance are our voters are too. Posted on October 26, 2015 December 16, 2015 by Noah	This entry was posted in Debate Preview and tagged Ben Carson, Carly Fiorina, Donald Trump, Marco Rubio, Republican Primary. Bookmark the permalink.